He stares about him, sharp-nosed, yellow-eyed. hold their soft soot untouched. Where has she gone? What sleeping leaves conceal his errant bride? a lady's narrow, faithless, foxy hand." I couldn’t improve on the text used to introduce this quite dramatic picture in the original Ladybird book: “Thunder-clouds have darkened the northern sky. In the foreground, sunshine is still bright on the bramble flowers, the foxglove and the pink campion. From the clouds, a fork of lightning flashes to earth, and nearby the thunder crackles. The farmer is just in time to stretch his tarpaulin and keep the rain from his newly-stacked hay. The clouded-yellow butterfly that is flying near the bramble will have to seek shelter if it is not to be beaten down by heavy rain – and possibly drowned.” A perfect description of the scene! Earlier pictures in this series have featured brambles, but without much comment. The bramble (Latin name: Rubus fruticosa aggregate) is a deciduous or semi-evergreen shrub which grows across a wide range of habitats, including woodlands and scrub, bankings, heathland, hedgerows, waste ground and around old settlements, abandoned habitations and ruins. The New Atlas of the British and Irish flora describes brambles as: “a taxonomically intractable aggregate of over 320 microspecies in Rubus subgenus Rubus”, so, a genetically confusing picture that hasn’t yet been (and might never be) resolved. It is native over most of the British Isles, except Shetland and Orkney on both of which, it has been introduced) and the highest central Highlands of Scotland. The New Atlas identifies that the distribution of the brambles “aggregate” hasn’t changed since the original 1962 Atlas. Foxgloves (Digitalis purpurea) are a very widespread biennial (or, sometimes, a short-lived perennial) native plant, found all over the British Isles. The New Atlas describes its habitat preferences thus: “in hedge banks, open woods and woodland clearings, on heath and moorland margins, river banks, montane rocky slopes, sea-cliffs, walls and waste land. It is often found in great abundance in disturbed or burnt areas, such as recently felled forestry plantations”. So, nearly everywhere then! And it is also widely grown as a garden plant, often little altered from the original wild form. 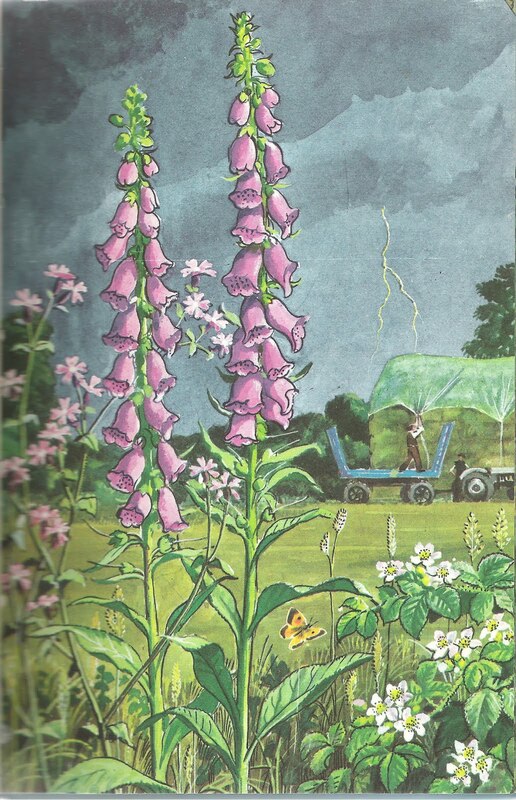 The distribution of the Foxglove is stable since 1962, a major factor in its success being its prolific seed production and persistent seed bank. I spend a measureable proportion of every Spring’s time in the garden relocating foxglove seedlings, from the generally inconvenient locations where they have seeded in, to new spaces where I group them together in big drifts for the greatest striking effect once they flower. The foxgloves shown here are a purple-pink colour but a purely white form occurs quite commonly in the wild. There is an excellent paradox about the foxglove - it has a hightoxicity but despite this was widely used in folk medicine. Indeed, as described by Richard mabey in Flora Britanicca, the floxglove is responsible for the first experiemnts and observation that led to the formation of modern pharmacology in the 18th Century when the botanist and physician William Withering explored the treatment of dropsy using foxglove leaves. But, pharmacologically speaking, the foxglove is best-known as the source of the drug digitalis, originally extracted from foxglove leaves and still used widely in conventional medicine as a heart stimulant drug. This is also described quite well here.. The final wild plant shown on the picture is the pink campion, or as it is more commonly known now, red campion (Silene dioica), which the New Atlas says is a short-lived perennial herb found in a wide range of habitats throughout the British Isles,and the distribution of which hasn't changed since the 1962 Atlas. I introduced this species into my garden as part of a biodiversity seed mix and it flowers for up to 7 or 8 months year. The clouded yellow butterfly (Colias croceus) is one of the truly migratory European butterflies and a regular visitor to Britain and Ireland. Butterfly Conservation reports that: "Although some of these golden-yellow butterflies are seen every year, the species is famous for occasional mass immigrations and subsequent breeding, which are fondly and long remembered as ''Clouded Yellow Years." Butterfly Conservation's report on the State of British butterflies reports that, for this species, it's long-term population trend is massively upwards, between 1979 and 2004, an increase of 1117%, and since 1970, its range has increased by 144%. These increases are thought int he report to be "probably due to climate change." The final element of this picture that I want to mention is the haystack that the farmer is so busy protecting from the impending rainstorm. This is the final reference in the Summer book to the hay-making process and, while I remember seeing haystacks like this when I was very young, haystacks are now typically composed of hay bales (and, as discussed previously, largely of round bales nowadays) or, in fact, hay-making, in many cases, has been replaced by the production of silage. hey big bro!...just to let you know i am reading all your posts if not commenting on them!, think i follow over 60 blogs so hard to keep up with them all, you put alot of effort into these and one day will be rewarded!,but i know already your are self satisfied cause your a mathieson!